Till Rolls - Massive Till Roll Stocks With Express Delivery. UK manufactured thermal and A grade paper till rolls to suit all cash registers, receipt printers, kitchen printers and credit card machines in the UK. 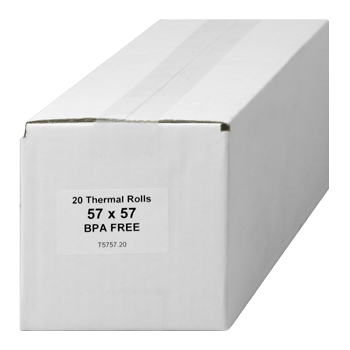 Our most popular 3 till roll sizes are available immediately below or scroll down the page to view by size, brand or printer type. Sharp till rolls at the best prices in stock for next day delivery. Casio till rolls at the best prices in stock for next day delivery. Sam4S till rolls at the best prices in stock for next day delivery. PDQ credit card machine paper rolls in stock for next day delivery. Full range of till ink rollers & ribbons available from stock. Made in Britain thermal paper till rolls for your till or EPoS receipt printer. EPoS receipt printer rolls in stock for next day delivery. Made in Britain paper till rolls for your cash register or dot matrix printer. Made in Britain ATM printer paper rolls.